... 1883, Eugénie Niboyet died in Paris, 87 years after her birth, as Eugénie Mouchon, in the southern French city of Montpellier. She grew up in a Bonapartist family, a number of whose members were jailed or died in battle. She married an attorney and gave birth to a son. 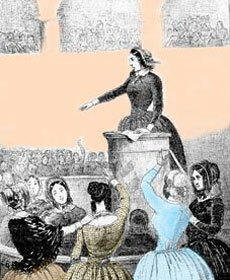 When the family moved to Paris in 1829, she began writing and became active in feminist and social-justice causes. Niboyet was a founder of, from 1844 to 1845, La Paix des Deux Mondes, France's 1st pacifist newspaper, and, in 1848, La Voix des Femmes, France's 1st feminist daily newspaper, which had a short but vocal life during the tumult of that latter year. (credit for image captioned "Eugénie Niboyet au Club Féminin") She's also known for her 1863 volume, Le vrai livre des femmes.